Comic-Con 2014 Preview Version - STILL FRESH! Prepare your brain, your body, your spirit and your travel bag. 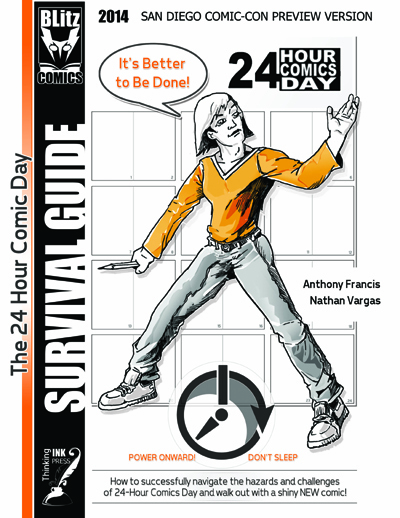 Learn what to do and what to expect during the 24HCD event. Click me to get instructions for all 13 exercises. Trust us, these are useful. 24HCD is tough. It's a challenge. It's a marathon of beautiful comics creation. EVENTS UPDATE: If you missed our Comic-Con panel, our APE IronHand Event, or our Creator Battle at Comic-Con 2015 you can catch us on September 27th for the "Writers Battle Event" at Peet's Coffee. Check the "Next Events" page for more info or click the link below. 2 FREE idea generating exercises - get you started now! The original 'Drawing and Timing Clock'. Small PDF so you can have it in seconds! Try the entire kit before you download. This time we offer a PDF to view and download much faster. Why didn't we think of this before? Because it was your feedback that put us on the right track. Thanks! We made some adjustments to the layout and optimized this version for Duplex Printing. This means the kit comes out doubled-sided. You have a clean layout, nice text, and a revised credits section. We are always improving our kit. This is our very first kit, ever. We keep it available here for archival purposes. We've come a long way since then. If you have any stories about the first time you used this kit, drop us a line.